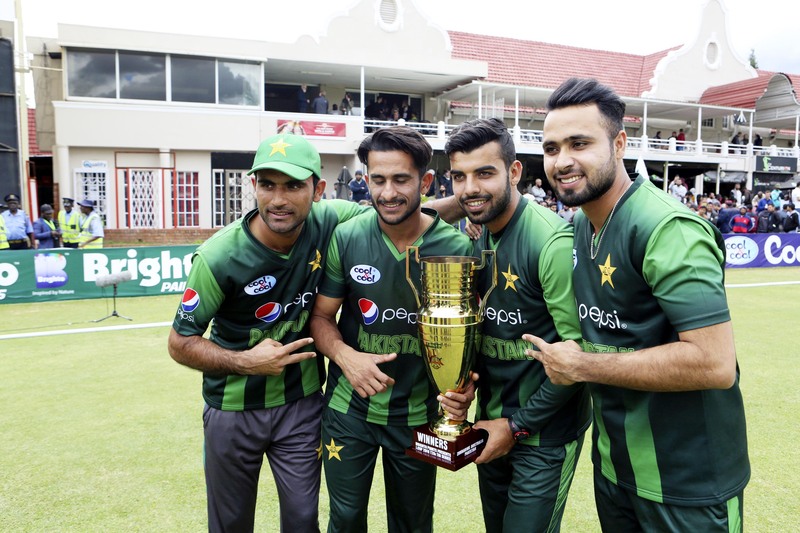 Pakistan players pose with the trophy after winning the final day of the T20 cricket match between Australia and Pakistan at the Harare Sports Club in Harare on Sunday. Pakistan captain Sarfraz Ahmed said Fakhar Zaman was in the "best form of his life" after the opener cracked a career-best 91 to help set up Pakistan's six-wicket win over Australia in the final of the Twenty20 tri-series at Harare Sports Club on Sunday. "I think nowadays he's in the best form of his life," Ahmed said of Zaman, who was named player of the series for his 278 runs. "The way he's batted throughout the series, it's good for us, and good for his career. He performs in big games, consistently. In the Champions Trophy, in the final, he got that hundred. In New Zealand, he scored a fifty and then a 40 odd. He's a big game player and he's getting better day by day." Zaman shared in a century stand with Shoaib Malik as Pakistan recovered from an early wobble in their pursuit of Australia's 183 for 8, and Malik then showed all the experience of an 18-year international career to see his team home in their highest ever successful T20I run chase with an unbeaten 43. "We know they're an emotional team, and they're a highly skilled team," said Australia captain Aaron Finch. "When they're on, they're incredibly good. We let them back into the game with bat and ball today."